Well, it only seems new. That's because Paul and I took everything out of the cabinets, bought some bins and reorganized. I'm awfully proud of it and I thought our ideas might help others with "problem" pantries. We rent, so it's not like we can remodel but we can rearrange. 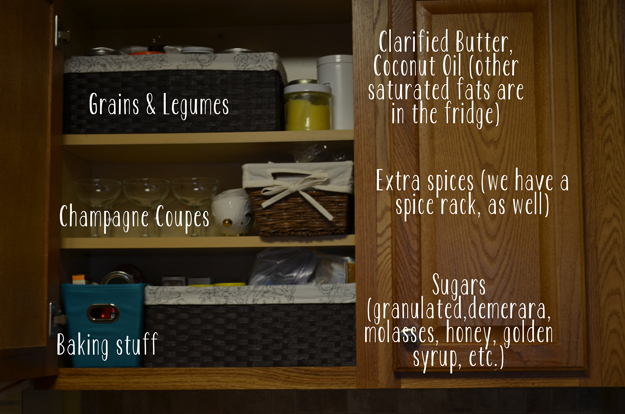 Our cabinets are so deep that it makes it really difficult to see what all we have (I had two bottles of molasses and two bottles of Karo syrup--I would just buy more because I didn't know what there was), so I decided to put everything in "media storage" bins. Welcome to a tour of my "new" kitchen! Wintry Herbal Tea from Lauren Hairston on Vimeo. Heather at Audrey Eclectic (that's her work above) is hosting a St. Lucia Blog Procession today to celebrate St. Lucia Day, which happens every December 13th. 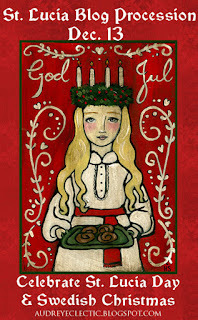 Before we switched to the Gregorian calendar, the feast of St. Lucia coincided with the winter solstice. * The holiday is a celebration of the return of light after months of short days and darkness. 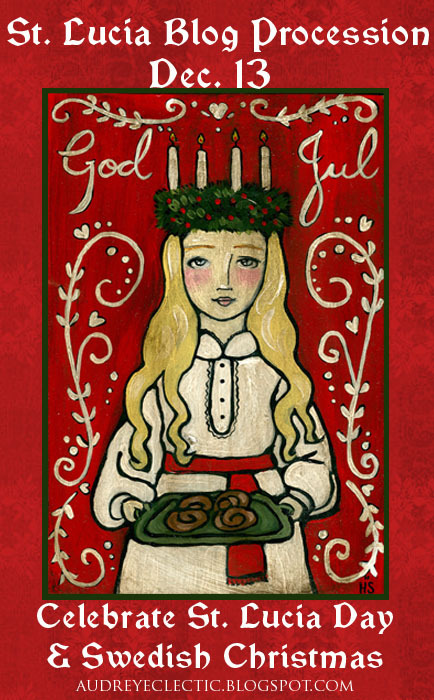 There's a town just north of us that does a Swedish Lucia Fest every year. Paul and I visited in 2010 and there's more about our visit at this previous post. I still haven't managed to make it back to Lindsborg to photograph the awesome taxidermy. Heather made the traditional St. Lucia buns last year, so I thought I'd provide a couple of other Swedish recipes you can use this holiday season. They're both terribly yummy and can be scaled up for a party. A Cake for "Bright Young Things"
If I had to pick one cake to represent England's carefree youth of the 20s and 30s, I'd have to choose a Fuller's Walnut Cake. 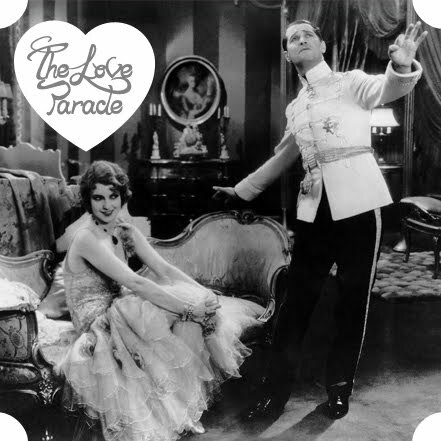 It's mentioned in both Evelyn Waugh's Brideshead Revisited and Nancy Mitford's Love in a Cold Climate. That's a good enough pedigree for me! 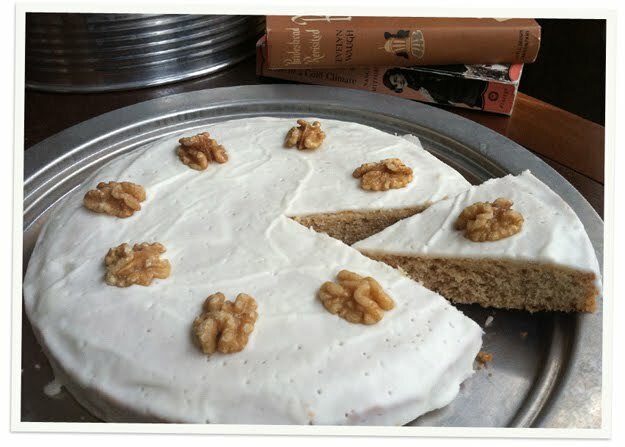 Turns out the original Fuller's Walnut Cake was two layers with buttercream between them, but the recipe I found was for a single layer cake. I'll definitely have to try it again. However, if you want something smaller and simpler than a layer cake, this recipe will work out just fine. It's subtly walnutty, not too sweet and delicious with a cup of tea and should definitely be eaten while curled up with an excellent book or DVD set. What an excellent way to spend Christmas vacation! Vintage Movie, Vintage Recipe--It's Visions of Sugarplums! If you're like I am and you get tired of all the "Christmas miracle" holiday movies, may I suggest Bachelor Mother? Polly Parrish (Ginger Rogers) is a seasonal employee at Merlin's department store, wondering where she's going to find a job after Christmas. Due to an enormous misunderstanding, her boss David Merlin (David Niven) believes Polly is an unwed mother and can be convinced not to give up her baby if only she has permanent employment. While Polly gets to keep her job she also ends up responsible for a baby that isn't hers! It's really only a holiday movie in the sense that it's set around the holidays and it's more about the time between Christmas and the New Year than about Christmas itself (although it does start on Christmas Eve), but don't let that stop you. I don't think there are enough post-Christmas movies anyway. 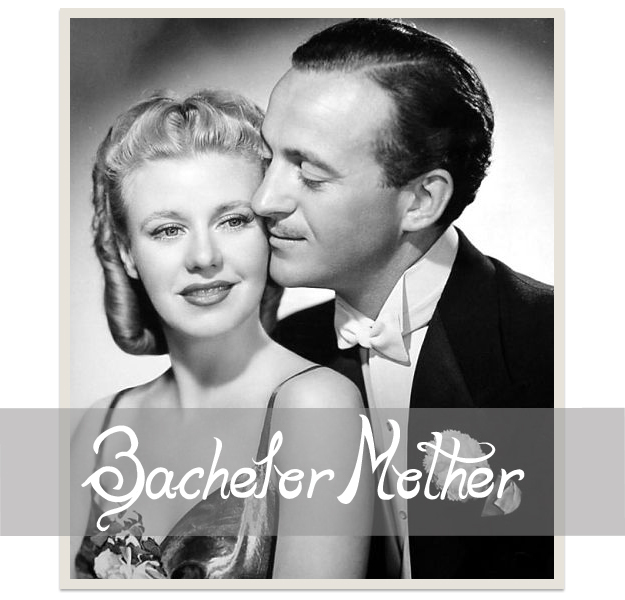 Bachelor Mother is available on DVD and will be on TCM December 20th at 10:15 pm (CST).